KISSIMMEE, Fla. (April 5, 2018) - The Florida Fire Frogs have announced their Opening Day roster for the 2018 Florida State League season, which features seven of the Atlanta Braves top-30 prospects, according to MLB.com. The top-two prospects come into the 2018 campaign at just 19-years-old each, as right-handed pitcher Ian Anderson (5) and outfielder Cristian Pache (9) continue their progress on the mound and at the plate. Left-hander Joey Wentz (10), right-handed pitcher Bryse Wilson (13), southpaw Tucker Davidson (23), catcher Brett Cumberland (24), and speedster Anfernee Seymour (25) round out the seven ranked prospects. Florida's roster includes 14 players that were on the Fire Frogs roster at any point in time during the inaugural, 2017 season. Those players feature: right-handers Mauricio Cabrera , Sean McLaughlin , Chad Sobotka and Devan Watts , and lefty Drew Harrington on the mound. Returning at the dish will be backstop Cumberland, infielders Braxton Davidson , Ray-Patrick Didder , Omar Obregon and Alejandro Salazar , and outfielders Justin Ellison and Seymour. The average age of the opening day roster is 22.2-years-old, with the youngest being Pache, who is just six months younger than Anderson. Right-handed pitcher Bladimir Matos (24) and infielder Marcus Mooney (24) both come into opening day as the oldest players on the roster with their shard birthday of Jan. 20, 1994. 20 players reside in the U.S., including three from the state of Florida: Sobotka, catcher Lucas Herbert , and Mooney. North Carolina is the most represented state on the roster, with right-handers Jeremy Walker , Watts and Wilson, and Davidson coming from the "Tar Heel" state. 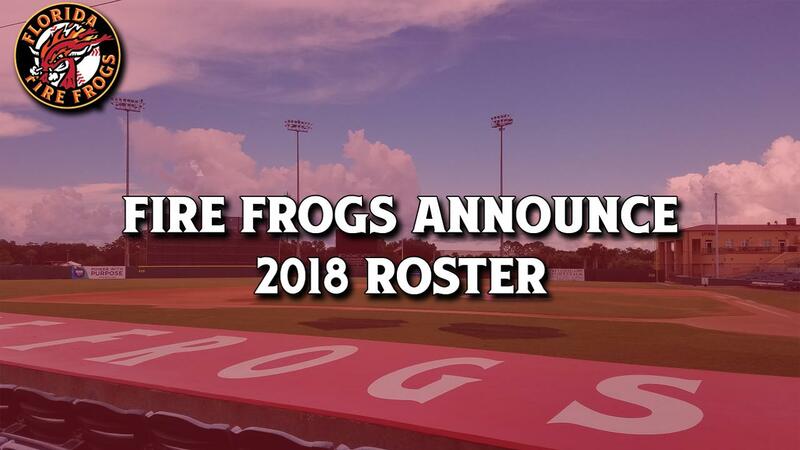 Five other countries are represented on the Fire Frogs in 2018, including the Dominican Republic (Cabrera and Matos), Australia (left-handed pitcher Jon Kennedy ), Aruba (Didder), Nicaragua (Obregon) and Venezuela (Salazar). Of the roster, 17 players were drafted by the Braves, including first-rounders Anderson (2016 - 3rd) and Davidson (2014, 32nd), two were acquired via trade (right-handed pitcher Justin Kelly and Seymour), and six signed as non-drafted free agents. Florida opens the new campaign on the road against the Daytona Tortugas on Thursday, April 5, before the home opener against Daytona on Saturday, April 7. Tickets for the 2018 season can be purchased by visiting FloridaFireFrogs.com, or by calling the Osceola County Stadium box office at (321) 697-3220.